Crinoids are marine organisms which have a skeleton made up of calcareous plates. They first appeared in the early in the middle of the Cambrian period and survive up until the present day. Modern crinoids have a wide distribution, and the fossil record shows a worldwide distribution during the geological past. Crinoids were so abundant in the Paleozoic era that their remains form vast thicknesses of limestone. These “great forests” of crinoids probably lived in fairly shallow water. Modern crinoids are also gregarious, tending to live in groups often of immense numbers. They seem to prefer relatively clear waters. The popular names for crinoids are "sea lilies" for fixed crinoids and "feather stars" for free-swimming crinoids. Crinoids are members a group called the Echinoderms. Echinoderms include the extinct classes Edrioasteroidea and Blastoidea. 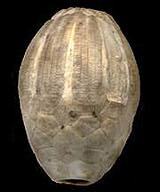 Here are two images of a blastoid head, also known as the crown. Echinoderms also include the well-known sea animals like the Asteroidea, which are the starfish; Ophiuroidea, which are the brittle stars; Echinoidea, which are the sea urchins and sand dollars; Holothuroidea, which are the sea cucumbers. To learn more about Echinoids, click on their icons below. 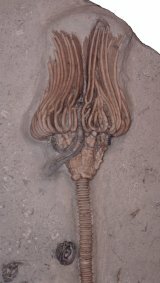 Most fossil crinoids lived attached to the sea-floor by a flexible stem, which may be either cemented to the sea floor by the crinoid, or it may have a root-like system buried into the sediment. Fossil crinoids have stems ranging in size from a few centimeters to as much as 21 meters (70 feet). The stem is circular, or pentagonal in section, and composed of numerous disc-like plates. At the top of this stem is a cup-shaped head called the calyx, to which the arms are attached. The calyx and the arms together are sometimes referred to as the crown. There are usually five arms and they are used to filter food from the water. Normally, soon after the crinoid’s death, the entire skeleton of the crinoid disintegrates into the small separate plates called ossicles. Often only the stem ossicles of crinoids are found as fossils. Complete, well preserved fossil specimens are rare, and beautiful. They look more like exotic plants, or flowers, than animals. This accounts for their popular name "sea lilies". The images below show an excellent example of well deserved specimen of a crinoid found in the Witherspoon Quarry in Montgomery County, Indiana, which is a source for such nice specimens. This particular fossil, also shown close up, was offered for sale with an asking price of $8,000. Some fossil crinoids, such as Pentacrinites, seem to have lived attached to floating driftwood and complete colonies are often found. Sometimes the driftwood to which they were attached became waterlogged and sank to the bottom, taking the attached crinoids with it. The stem of Pentacrinites can be several meters long. Modern relatives of Pentacrinites live in gentle currents attached to rocks by the end of their stem, which is fairly short. 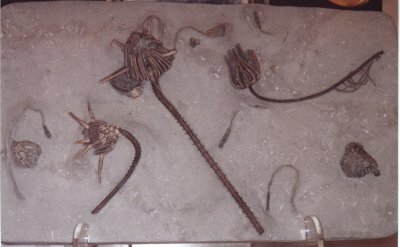 examples of free-swimming crinoid fossils are Marsupites, Saccocoma and Uintacrinus. 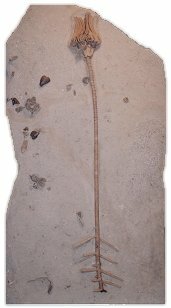 Many fossils of free-swimming crinoids such as Pterocoma, are found in the Jurassic lithographic limestone of Solnhofen in Germany, and the Cretaceous Niobrara chalk of Kansas contains large numbers of Uintacrinus. An abundance of stemmed crinoids occurs in the rocks of the Silurian period of the United Kingdom and the eastern United States. This is true in the Devonian period of Kentucky, Michigan, New York state. It is also in the Eifel region of Germany, the Carboniferous period of the United Kingdom, Belgium and Russia. There is the Mississippian period of Iowa and Indiana, and the Pennsylvanian period of the mid-continental United States. Such stemmed crinoids are found in the Permian period of the island of Timor, and the Triassic period of Germany as well. Sometimes bumps or swellings with one or more holes in their center are found on the stems of fossil crinoids. These were caused by parasitic worms whose remains are not preserved. To see fossil examples of the results these parasitic worms caused on the stems, or to see fossil example of the different shapes and sizes of these stems, just click on the icon at right to see what we have discovered. Please keep checking back to see what we have added. Please send any suggestions for this page to us. For more information on The History House, contact The History House.